The budget sequester, the across the board budget cuts that Republicans in Congress insisted on in August 2011 as a condition for allowing the public debt ceiling to be raised, entered into effect on March 1. While there were some immediate impacts, the primary effects will start a month to two later as government employee furloughs begin to go into effect and public procurement contracts are cancelled or are not signed when they otherwise would have. Fiscal drag will grow, aggregate demand in the economy will be reduced, and growth in both output and employment will be less than they otherwise would have been. And this hit is coming when there have been signs that the US had started to enter into a more robust recovery, with the housing market starting to recover and consumer demand growing. The sequester will now slow this down, and possibly reverse it. The argument for the sequester was that such budget cuts were necessary to bring down the public debt. Public debt as a share of GDP has indeed grown sharply in recent years. But as was discussed and analyzed in a posting on this blog from more than a year ago, this issue arose not because of government spending under Obama, but rather because of the Bush tax cuts, the spending on the Afghan and Iraq Wars (the first wars in US history which were not paid for at least in part by tax hikes, but rather purely by borrowing), and the economic and financial collapse that began in 2008, in the last year of the Bush Administration. That blog shows that without the Bush tax cuts and without the unfunded wars, but still assuming the 2008 downturn happened (thus reducing public revenues while increasing expenditures that rise in a downturn such as for unemployment compensation) and including all the spending of the Obama years (other than for the wars), public debt at the end of FY2012 would have been only 32% of GDP instead of 73%. The difference between a public debt ratio of 32% of GDP and a ratio of 73% of GDP is not small. The Bush tax cuts (mostly) and the unfunded wars (to a still significant, but lesser, extent) certainly weakened the US fiscal position. Without that increase in the debt due to those two decisions, there might have been less pressure on Obama to cut back on government spending, with the resulting fiscal drag that has slowed the recovery. Looking forward, that blog post also showed that even with the history of the Bush tax cuts, the unfunded wars, and the effects of the 2008 downturn, a phasing out of the Bush tax cuts (thus returning to the rates of the Clinton years) would have led to a steady fall in the public debt to GDP ratio from FY2014 to at least FY2022. Unfortunately, the Bush tax cuts have now been made permanent for all but the richest 1% of the population. As a direct consequence of this, the public debt to GDP ratio will not now see a steady fall (to at least FY2022) as it otherwise would have. The graph above shows what the CBO now projects the public debt to GDP ratio will be under its baseline scenario, along with calculations I did (based on numbers provided in the CBO report and its accompanying data files) under several alternative scenarios. The CBO Baseline scenario presents, as the CBO is required to do, its projections of what the budget and debt will be assuming current law is followed. In this scenario, the CBO projects that the public debt to GDP ratio will peak at 77.7% of GDP in FY2014, and then fall to a trough of 73% of GDP in FY2018 before starting to rise again. It would reach 77% of GDP in FY2023. The permanent extension of the Bush tax cuts for 99% of the population, which reduces sharply government revenues (by 2 1/2% of GDP now, rising to 3% of GDP in the 2020s and more beyond, for the full Bush tax cuts, as discussed in this blog post). As noted above and discussed in the cited blog post from a year ago, if the Bush tax cuts had been phased out, the public debt to GDP ratio would have been falling to at least FY2022. The CBO’s projection that government health care costs (primarily for Medicare and Medicaid) will continue to rise as a share of GDP as general health care costs rise in the US, and (to a lesser extent) due to the aging of the population. The reforms achieved through ObamaCare will reduce Medicare expenses by a significant amount as more of the currently uninsured become insured (since the uninsured cannot cover the full cost at hospitals of their treatment, so hospitals must shift a portion of those costs onto what they charge Medicare, as discussed in this blog post). But there is a need for more such savings, which reduce costs while they maintain delivery of currently covered services. The assumption that a portion of the special appropriation enacted in January for Hurricane Sandy relief will not be repeated each year going forward. This will lead to $353 billion in lower federal expenditures than CBO had to assume in its Baseline over the ten year period of FY2014-23 (including lower debt service following from the consequent lower debt). The assumption that overseas troops (primarily in Afghanistan) will continue to be drawn down, from 115,000 in FY2012 and 85,000 in FY2013, to a projected 60,000 in FY2014 and 45,000 in FY2015 and after. The CBO assumes there will still be a significant number of such special combat troops overseas after FY2015, but not as many as now. This will lead to savings of $693 billion over ten years. But increasing costs is the assumption that the so-called “Medicare Doc Fix” will continue. Under a law originally passed in 1997, Medicare payments to doctors would be cut according to a formula. But that law has been overridden each year since 2002, and everyone expects that will continue. If it were not, payments to doctors would be slashed by 27% this year. Continuing the override, the ten year cost to the budget would be $167 billion. Also increasing the deficit, by reducing revenues, is CBO’s assumption that a large set of 75 different corporate tax “provisions” (others might call them loopholes) will continue to be extended, rather than allowed to expire as per current law. The cost of extending these tax provisions over the ten years is an estimated $1,142 billion. Making these four changes, will have the net effect of adding $263 billion to the ten year deficit. This is, however, a more realistic estimate of the baseline. The resulting public debt to GDP ratio would be 78% of GDP in FY2023, rather than 77%. There are many scenarios one could run against these baselines. For the graph above I have shown two. 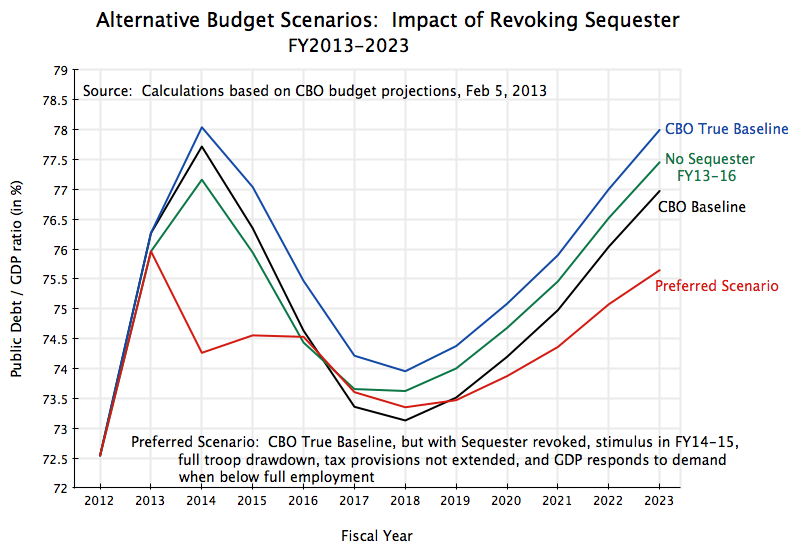 The first alternative scenario looks at the impact of revoking the sequester in fiscal years 2013 to 2016. The rest is as in the CBO Baseline. While not a primary focus of the CBO budget work, the CBO forecasts that the economy will recover only slowly from the current downturn (in part precisely because of the fiscal drag from the budget cuts that have been and are being implemented), and will only reach full employment production in FY2017. The CBO then assumes the economy will grow from that point forward at the rate of growth of potential GDP (what GDP would be at full employment), which it projects based on its projections of growth in the labor supply and productivity. The No Sequester FY13-16 scenario revokes the sequester in those four fiscal years, and includes the impact of such extra spending in creating demand for production, assuming a multiplier of two. With this modest boost to GDP (higher growth rates of 0.6% points in FY13 again in FY14, and then about the same as in the CBO Baseline), tax revenues will also rise. The projection also assumes that 33% of this additional GDP growth will provide resources to reduce the deficit, either through additional tax revenues (mainly) or by reducing certain government expenditures such as for unemployment compensation (to a lesser extent). The 33% is a rough estimate of the impact of these two together. They will offset part of the impact on the deficit of the cost of the extra expenditures if the sequester is revoked. Due to the modestly faster recovery of GDP if the sequester is revoked in those years when the economy is operating at less than full employment, the debt to GDP ratio is in fact lower in fiscal years 2013 to 2016 than it is in the CBO Baseline, despite the higher government spending. It hits 77.2% of GDP in FY2014 rather than the 77.7% of GDP in the CBO Baseline. This illustrates how austerity policies (the sequester) have a perverse impact on the public debt to GDP ratio in the near term when an economy is functioning at less than full employment, due to a lack of demand. The revocation of the sequester in FY13-16 will, however, lead to a somewhat higher debt than in the baseline, under the stated assumptions. And from FY2017 onwards GDP is already at its potential level at full employment and cannot go higher. Hence the debt to GDP ratio will be higher from FY2017 onwards, by about a half percentage point of GDP. But that would then be the time to cut back on government spending if one is concerned about the public debt to GDP ratio. That is, do not cut back further on demand when it is already insufficient, leading to higher unemployment. Rather, the time to reduce government demand, if the debt ratio is of concern, is when the resources in the economy are fully employed and will be used for other purposes and not left idle. Cutting back on such demand for workers when resources are idle, with unemployment high, simply leads to even higher unemployment. The sequester is revoked in all years. This will increase expenditures by $1,223 billion over ten years (including the impact on debt service). Rather than cutting spending, as in the sequester, one instead boosts government spending in fiscal years FY2014 (by $400 billion) and FY2015 (by $250 billion). These levels were chosen as such extra spending will, under the stated assumptions, boost growth sufficiently to bring the economy back to full employment and then keep it there, in the years when there would otherwise be high unemployment. Rather than draw down overseas troops only to 45,000 from FY2015 and after, as in the CBO True Baseline, the Preferred Scenario brings down troops faster and further, to only 5,000 from FY2015 and after. This will save a further $702 billion over ten years, above the savings of $693 billion CBO estimates will be achieved by bringing overseas troops down to 45,000. The CBO True Baseline assumes that the 75 different corporate tax provisions will be extended when they would otherwise expire under current law (mostly this year and next), at a budgetary cost of $1,142 billion over ten years. The Preferred Scenario assumes these will not be extended. Under the Preferred Scenario, the public debt to GDP ratio falls sharply in FY2014, despite the extra spending and indeed a higher fiscal deficit, because of the boost to GDP bringing it to full employment levels. Commentators often forget that the debt to GDP ratio depends not only on what the debt is, but also what GDP is. The sharp fall in the debt to GDP ratio also holds in FY2015 (compared to the Baseline scenarios), because of the boost to GDP, but by FY2016 and FY2017 the ratio is close to that in the Baseline scenarios as GDP approaches the ceiling of its potential level in the CBO projections, and cannot go higher. Going forward, with GDP at the ceiling of its potential level, the debt to GDP ratio follows a lower path than it does under the CBO Baseline (or True Baseline) scenarios. The reason is that in those years the savings from the lower troops deployed overseas in combat, plus the additional revenues from not extending the 75 corporate tax provisions, leads to lower deficits and lower debt growth. It is in such periods, when the economy is operating at full employment (by CBO assumption), that one should focus on reducing deficits if the debt to GDP ratio is of concern. The debt to GDP ratio nevertheless starts to rise again after FY2018 in the Preferred Scenario, as it does in all the scenarios. The blog post from last year cited above noted that phasing out the Bush tax cuts would have led to a declining debt to GDP ratio until at least FY2022. But with the extension of the Bush tax cuts for 99% of the population this will now no longer hold from FY2018. The primary reason these debt to GDP ratios ultimately turn up is the continuing rising cost of health care unless something is done. And note this is not because government provided health care through Medicare is more expensive than health care provided through private insurance. For similar risk populations, Medicare is indeed more efficient and cheaper to provide than private health insurance. The CBO estimated that in 2007, private insurance of Medicare beneficiaries cost the government 12% more than traditional Medicare would have. The problem rather is that health care costs are rising, and while there are savings through government programs such as Medicare, these savings are not enough to offset the expected long term rise in health care costs unless something further is done to reduce the costs. The debt to GDP ratio has risen in recent years as a consequence of the Bush tax cuts, the unfunded wars in Iraq and Afghanistan, and the economic collapse of 2008 with the subsequent slow recovery. But as high as it has risen, it is now foolish to follow austerity programs, such as the sequester, with unemployment still excessively high. These austerity measures serve just to hold back the economy, and will increase, not decrease, the near term debt to GDP ratio over what it would have been without such fiscal drag holding back growth. A program of fiscal stimulus sufficient to bring the economy back to full employment would indeed lead to a sharp reduction in the debt to GDP ratio over the next few years. Longer term, there is a rise in the debt to GDP ratio in all the scenarios after FY2018, due to a rise in health care costs unless something is done to reduce these costs. The problem is not that government supported health care funded through Medicare or Medicaid is more expensive or less efficient than private insurance funded health care – the government programs are indeed cheaper and more efficient. The problem is health care cost itself in the United States. But that is an issue I hope to address in future posts on this blog. This entry was posted in Fiscal Issues and tagged austerity, fiscal rules, GDP, government spending, public debt by aneconomicsense. Bookmark the permalink.